More than 200 leading domestic and foreign experts in the field of oncology, surgery, urology, radiology, nuclear medicine attended this year’s conference. Olzhas Abishev, Vice-Minister of Health of the Republic of Kazakhstan, Bruno Gridelli, Medical and Scientific Director of University of Pittsburgh Medical Center (UPMC International), U.S.A, Ilesanmi Adesida, Provost, Nazarbayev University, Massimo Pignatelli, Vice President for Medicine - Dean of the School of Medicine, Nazarbayev University, Zhaxybay Zhumadilov, Chairman of the Board of UMC corporate fund and Director General, NLA, Zhaksylyk Doskaliev, Head of the Republican Coordination Center on Transplantation and others were among the invited speakers of the conference. During the conference, the large group of medical workers of UMC corporate fund were conferred breastplates “Денсаулық сақтау ісінің үздігі” and “Денсаулық сақтау ісіне қосқан үлесі үшін” for their merits and significant contribution to the medical development of the country, as well as honorary diplomas and letters of thanks from Minister of Health of the Republic of Kazakhstan and President of NU. The conference was moderated by renowned experts. Highlights included sections on topical issues of surgery and organ transplantation, modern technologies in nuclear medicine, anesthesiology, intensive care and onco-hematology. Participants also exchanged views on the achievements in the diagnosis and treatment of severe allergic syndromes. 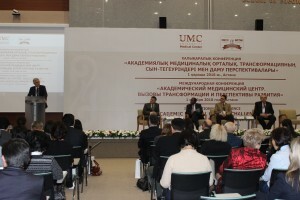 Following the results of the international conference, a resolution was adopted, which outlined the prospects for the development of UMC as an advanced academic medical center where high-level medical care will be provided, taking into account the synergy of research, educational and clinical activities. The novel ion accelerator facility INURA (Innovative Nazarbayev University’s Research Accelerator) was recently installed at the 1st floor of S4 building at Nazarbayev University and produced the first ion beam. It was built as a result of 5 years effort, funded through the state target program “NU-Berkeley strategic initiative in warm-dense matter, advanced materials and energy sources”, funded by the Ministry of Education and Science of the Republic of Kazakhstan. 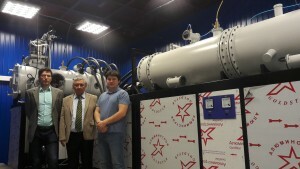 The accelerator was designed and fabricated in collaboration with a LBNL (Lawrence Berkeley National Laboratory) and TPU (Tomsk Polytechnic University). At NU side, the project was envisioned and generally directed by Dr. Kanat Baigarin, and executed by a team guided by SST Physics assistant professor Alexander Tikhonov and NLA Senior Researcher Dr. Marat Kaikanov. Accelerator INURA is a pulsed high current ion accelerator. It provides a 10 000 Amperes ion current in 80 nanoseconds, with the ion energy of 400 keV. INURA is a multi-purpose ion accelerator, developed both for fundamental and applied research. It will be used to modify and fabricate new advanced materials, from the solid bulk to nano materials, as a high-current ion beam is able to modify materials structure and properties. It will be also used for plasma and charged particles beams studies. Future uses of INURA include developing of commercialized technologies, such as materials hardening/wear resistance improvement, fabricating nanopowders, bio-agricultural applications. The INURA capabilities has already attracted large interest and collaboration activities from several research groups at NU, Kazakhstan and international research centers. Several research projects has already been started, among them: fabrication of transparent conductive coatings; ion beam transport and focusing in plasma; fabrication of nano-powders and modification of nano-structures.